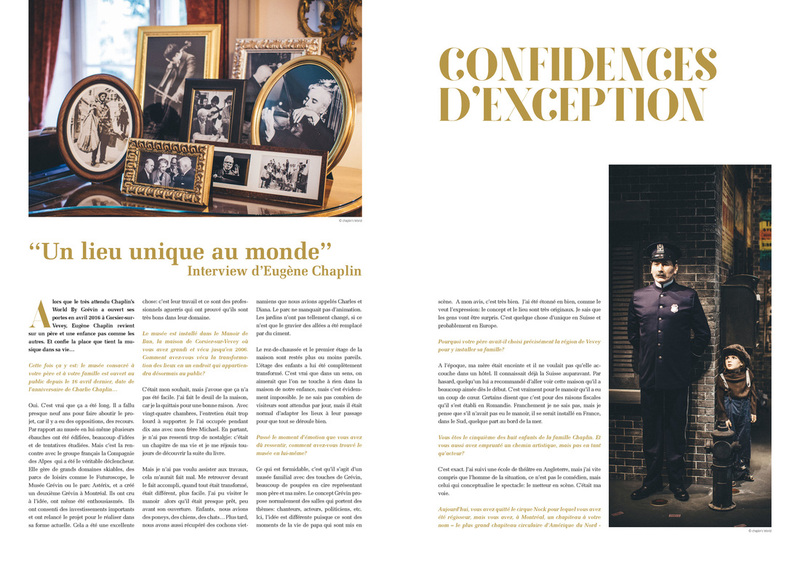 As part of its 70th anniversary celebrations, the Septembre Musical Foundation has decided to offer its public an exceptional magazine tracing the unique history of this Festival, which was established in the wake of the Second World War and flourished over seven decades before presenting the jubilee edition which will be held between 26th August and 4th September 2016 on the Riviera. 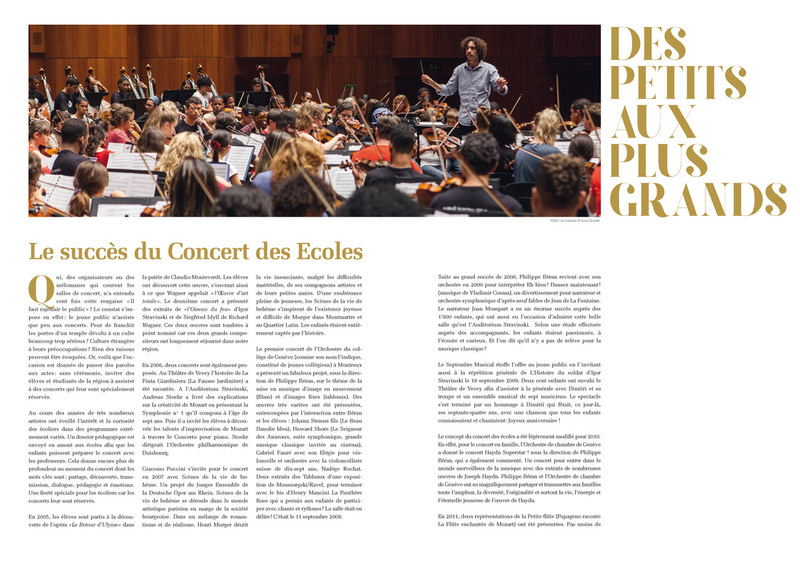 This initiative is part of the logical continuation of the vitality which is the hallmark of the Septembre Musical Festival since it set itself new challenges, to rejuvenate both its image and its public. Supported by prominent figures from the worlds of politics and business in the Swiss Confederation, the canton and the region, the resolutely forward-looking Septembre Musical Festival, has launched innovative projects, in particular the musical village, the Festival OFF, and above all the magazine. 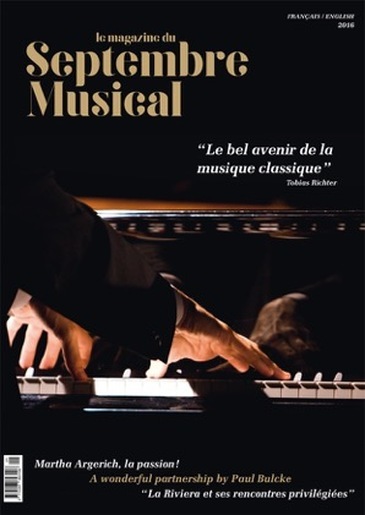 The publication of which symbolizes this new momentum of a festival which is aiming to boost its reputation, increase its audience and intensify its memory. In this context, the positioning of the magazine, just like the festival, is meant to last and aims to become the festival’s showcase, but also the memory of its editions, as each of them is a unique and fleeting event. At the heart of a convergence of talent comprised of the most prestigious orchestras in the world, such as the Royal Philharmonic Orchestra, the sublime Perm Orchestra or the moving Youth Orchestra of Bahia (YOBA) in Brazil, passion is what connects all these musicians, who, within a performance, give their very best to allow others to discover their art. 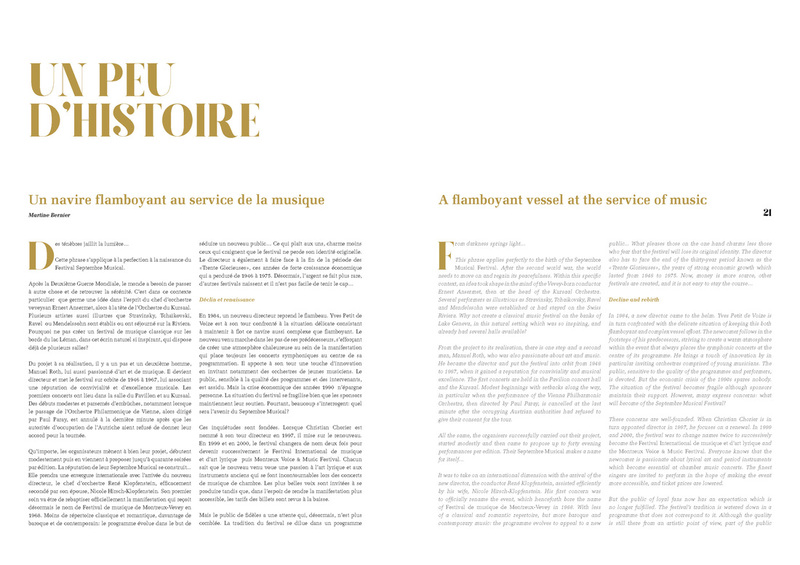 There is therefore nothing more natural than recalling a few notes from this score which has been played for 70 years and which, beyond the recognition of its public and its region, deserved written testimony, in the shape of this magazine. Classical music is universal and transcends souls whatever their age or wherever they are. Long live the festival and long live the magazine!